Their babysitter, Mrs. Greenwood’s 19-year-old niece, had vanished mysteriously. Two days later, police announced that they had found the body of Lori Cawley in a wooded area off I-70, ten miles from the Greenwoods’ home. 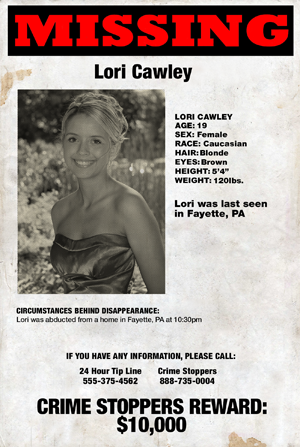 Police launched a ground search effort for Ms. Cawley after responding to the scene and discovering that all of Ms. Cawley’s personal effects had been left behind. The front door of the Greenwoods’ home was unlocked, and a family vehicle was still in the garage, leading the responding officer to determine that Ms. Cawley had been abducted. Police have not yet released a cause of death, but a spokesperson for the family says that Ms. Cawley was a victim of homicide. The two young children left in the home the night of the abduction gave police a harrowing account—while sleeping on the floor in the family’s enclosed sunroom, both girls saw a man casing the side of the house. Mrs. Greenwood’s daughter alerted Ms. Cawley, who went outside to scare off the intruder. Ms. Cawley assured the children that no one was in the yard, and both went back to sleep. When the Greenwoods returned shortly before two in the morning, their niece was gone. The Greenwoods are baffled that their niece did not call the police about a possible intruder in the backyard. 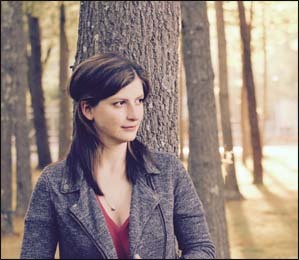 Ms. Cawley was a rising sophomore at Drexel University, where she studied engineering. She is described as vibrant and loved by everyone who met her. “We volunteered at the animal shelter together the summer after high school,” said Morgan Cavanaugh, 19, a friend of Ms. Cawley’s. “All she wanted to do was help people and be a force of good in the world.” When word of her death reached Drexel’s student body, classmates and friends poured onto the campus quad, leaving flowers and messages of support. A memorial service will be held in Germantown, Ms. Cawley’s hometown, this weekend. Police have yet to comment on a possible connection between Cawley’s murder and the unsolved homicides of three women along I-70. The remains of Marisa Perez, 19, Rae Felice, 21, and Kristal Davis, 24, were all found last year, prompting investigators to search for a serial killer the media has dubbed “The Ohio River Monster." 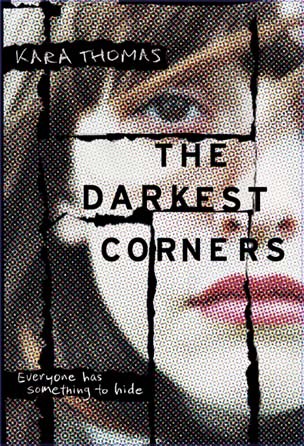 THE DARKEST CORNERS, coming April 19, 2016 from Delacorte Press. She’s a True Crime addict who lives on Long Island with her husband and rescue cat. There are ghosts around every corner in Fayette, Pennsylvania. Tessa left when she was nine and has been trying ever since not to think about it after what happened that last summer. Memories of things so dark will burn themselves into your mind if you let them. Callie never left. She moved to another house, so she doesn't have to walk those same halls, but then Callie always was the stronger one. She can handle staring into the face of her demons--and if she parties hard enough, maybe one day they'll disappear for good. Tessa and Callie haven't talked about what they saw that summer night since it happened. After the trial Callie drifted and Tessa moved and childhood friends just have a way of losing touch. But ever since she left, Tessa's had questions. Things have never quite added up. And now she has to go back to Fayette--to Wyatt Stokes sitting on death row; to Lori Cawley, Callie's dead cousin; and to the only other person who may be hiding the truth. Only the closer Tessa gets to the truth, the closer she gets to a killer--and this time, it won't be as easy to run away. Fayette – A thief pocketed a pair of earrings while shopping in a Fayette County beauty shop and then beat an employee who caught him in the act, authorities said. Fayette – A burglar is targeting businesses across Fayette County. He first struck around 2 a.m. Oct. 29 when he used a crowbar to pry open a security gate at a local barbershop. Fayette – A man robbed a cab driver in Washington, PA and then stole his car, authorities said Monday. The suspect hailed the cab at Main Street and Bainbridge Avenue. Copyright © 1995-2016 Penguin Random House LLC. All rights reserved. © 1820-2016 Fayette Gazette. All rights reserved.